From a personal point of view I have always felt that Christmas should start around 2 weeks before the 25th December. I hate seeing mince pies for sale in October and avoid looking at Christmas Decorations until I have to admit defeat in early December. Where other children wanted to open their presents before the big day I was horrified at the thought and although I am now grown up I would never peak, shake or rip the wrapping paper! However as a seller I have learnt that I have to embrace the festive season a lot earlier. Last year I was a bit late in getting my Christmas Stockings online so this year I had to be more organised. 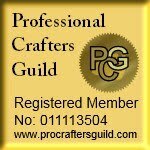 Some sellers have had their Christmas ranges up for sale since October but I opted for a mid-November launch to tie in with CRAFTfest, a online craft fair. This has hopefully given enough time for sales but is not too early for the magic to run out! So having launched my new range of Mini Christmas Stockings at CRAFTfest they are now available from my Folksy shop. This year I found a great range of new retro fabrics as well as some of my favourite fabrics from last year. I have also included some individual gingham designs for those who like to be more traditional. Although I hope I have good sales this year lets hope there are a few left so I can use them to decorate my own home!